Caramel Apple Cheesecake – Voila! When this cheesecake came out of the oven, I had my doubts. It didn’t seem to look right and the layer of cheesecake seemed pretty thin. I tried to console my concerns by telling myself that the cake also had all the right ingredients for what sounded like a delicious combination of flavors. But my skepticism continued. And on top of all this, I planned on bringing it to a work holiday party! They might judge me! They might never eat the food I bring into the office again! The horror! The embarrassment! Oh wait, I over-analyzed everything. It was delicious. When you spread the whipped cream/caramel topping over it, you forget anything was ever slightly wrong with it. I still believe the cheesecake layer is a bit thin, but it definitely did not detract from overall taste. Now that I vented all my pre-cake worries, you don’t have to think about it! 1. Combine the butter, heavy cream and brown sugar in a medium heavy-bottomed saucepan over medium-high heat. 2. Bring the mixture to a boil, stirring constantly. Once it reaches a boil, lower the heat to medium and continue to boil until the mixture is thickened, about 8 minutes. Remove from heat and let cool. Preheat the oven to 375 F. Line the bottom of a 9-inch round springform pan with parchment paper. 1. In a medium mixing bowl, combine the graham cracker crumbs, sugar, cinnamon and melted butter. Toss with a fork until all the crumbs are moistened and the ingredients are evenly mixed. 2. Transfer the mixture to the prepared springform pan and press the crumbs in an even layer over the pan bottom and about half to two-thirds of the way up the sides of the pan. 3. Bake for 6-8 minutes, until golden in color. Let cool for about 10 minutes. Then reduce oven heat to 350. 4. Pour a layer of caramel into the bottom of the crust and sprinkle evenly with the chopped pecans. Refrigerate the crust while you prepare the filling. 1. Melt the butter in a large skillet over medium heat. Mix in the brown sugar, salt and cinnamon and cook for 1 minute, until bubbling. 2. Mix in the apple slices and toss well to coat. Cook over medium to medium-high heat until tender and most of the liquid has been reduced, about 15-20 minutes. Let cool for a few minutes and pour into the prepared pie shell. Set aside. 1. Combine the cream cheese and sugar in the bowl of an electric mixer and beat on medium speed until smooth, about 1 minute. 2. Mix in the vanilla, egg and lemon juice until fully incorporated and smooth, 1-2 minutes. 3. Spread the cheesecake filling into an even layer over the top of the cooked apples in the crust. 4. Bake until a knife inserted in the center comes out clean, about 30 minutes. Remove from the oven, transfer to a wire rack and let cool to room temperature. Refrigerate for at least 4 hours up to overnight. 1. To serve, carefully remove the sides of the springform pan. 3. Spread gently over the top of the chilled cheesecake layer. 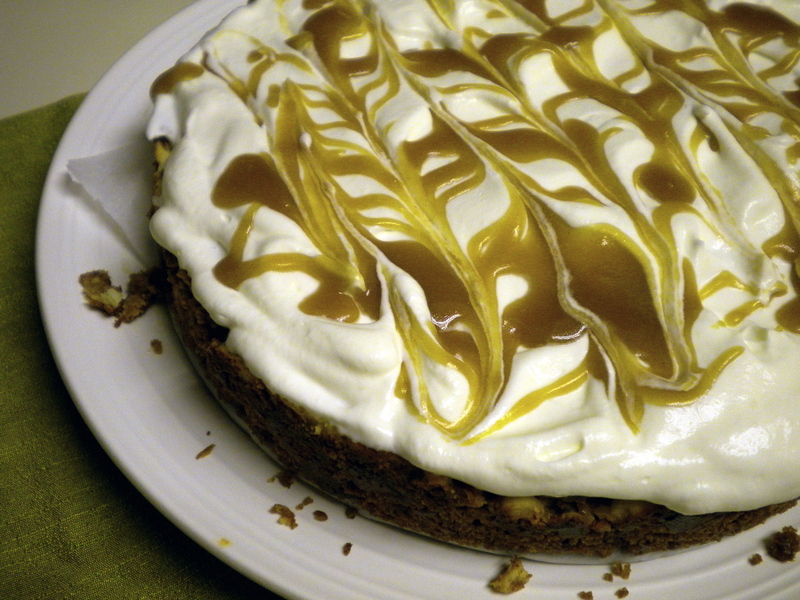 Top with dollops of caramel sauce and swirl with a knife to create a marbled effect. Sprinkle with a handful of chopped pecans if desired. Next Post Featured on Foodista!